We are looking forward to our Conference on 3rd July. We’d like to introduce one of our keynote speakers in more detail. We first heard Dominic speak at the SSAT National Conference 2016 and knew we wanted to invite him to join us. Dominic is very dynamic and will certainly bring a powerful and lively start to our day! He will also be hosting a small workshop for those interested in drawing out the best in those who love to sing! We hope to have a small group of students who can join us for this who will then perform at the close of the conference. A free information evening for graduates, career changers and those thinking about teaching. Please find below the latest Teaching School Newsletter for March 2017 for the South West – a big region! This extract sums up the key role Teaching Schools are continuing to play in keeping schools engaged and improving. 2. All teaching schools actively seek to involve new schools especially schools affected by rural isolation and sparsity. We would like to invite you to our 4th Annual Conference on Monday 3rd July. 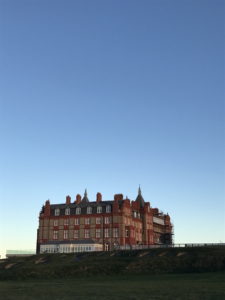 We hope you will join us at the Headland Hotel, Newquay for a day of discovering strategies and bringing people together with a shared purpose. The educational landscape is always changing and evolving, but we want to focus on the wellbeing and deeper challenges affecting our young people with some leading practitioners who will share their experiences and offer practical solutions. Some schools have already block-booked places, so avoid disappointment you are encouraged to at least reserve your place now. We will be releasing further details on keynote and workshop themes in April. To make enquiries or to reserve any places, please fill out the Enquiry Form below. Reserved places need to be confirmed by mid May. Please select a ticketing option appropriate for organisation. If you require another payment method, please indicate in Comments box below. A twilight “STEM in Cornwall” Showcase and networking event is being held at Truro College on the 1st of February from 5-7pm. This is a free opportunity to meet with a range of other teachers, local STEM employers and outside agencies (RSC, IOP, STEM Ambassador network, National STEM centre, Maths Hub). The aim of the event is to help get likeminded STEM educators together to build relationships and partnerships to continue to improve STEM education and opportunity in Cornwall. It will also give you an opportunity to find out how we might tap into national initiatives to enrich our curriculum. Sign up is here and the event is completely free. Whilst the 1:1 deployment of digital devices in schools is becoming more popular, there can be pitfalls that prevent a successful and sustainable implementation. Mounts Bay Academy has been using iPads in a 1:1 environment since 2011, getting global recognition and gaining Apple Distinguished Schools status. This event, for school leaders, business managers, IT technical staff and e-learning co-ordinators, will discuss the day-to-day realities of 1:1 iPad schemes and includes hands-on experience, pedagogical and technical presentations and a look at real 1:1 lessons using iPads. The visit includes lunch and refreshments and opportunities to talk with staff and students. Have the chance to chat with staff and students about how they use iPads, both in and out of lessons. We are looking forward to the new recruitment cycle for Initial Teacher Training, taking applications from 18th October (apply via UCAS). We will be attending a couple of recruitment events in November, where you can come along to find out more and ask questions. Train to Teach Roadshow at Exeter on Tuesday 15th November. 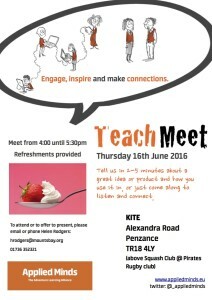 Join us for our last Teachmeet of the year – and enjoy networking, great talks and some summer strawberries and cream! Are you enthusiastic about using technology in teaching and learning? Come along to this invite-only event to share ideas and network with likeminded colleagues interested in transforming learning with technology. 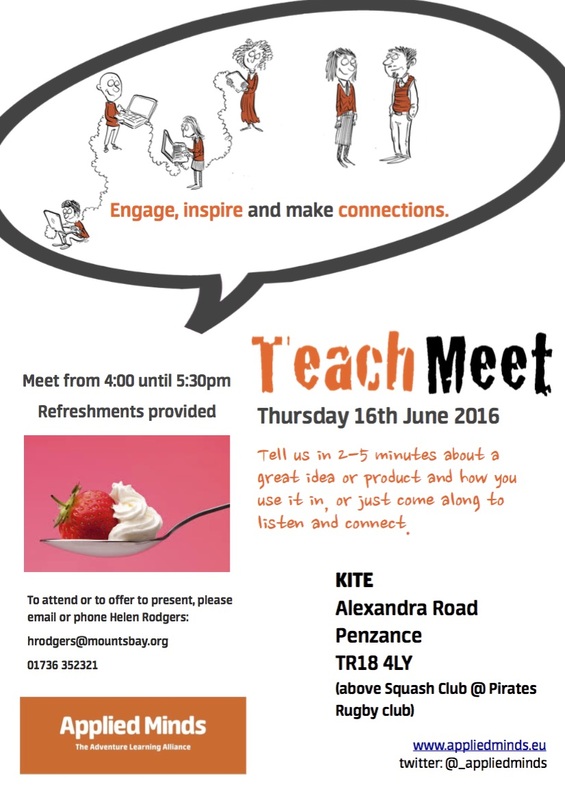 Hosted by Mounts Bay Academy, an Apple Distinguished School, you’ll be able to connect with other teachers and leaders from the Apple education community, showcase ideas, and participate in a collaborative project. Apple Education community event at The Cube, Mounts Bay Academy. If you want to contribute a 5 minute interesting, inspiring, insightful to share around educational technology, please let us know.